Step 1 Tear the bread into rough pieces into a bowl (you should have about 2 1/2 cups bread pieces), and pour the milk over. Let soak. Heat the butter in a large skillet over medium heat and saute the onions slowly, stirring occasionally. After a few minutes, cover the pan and continue to saute over low heat, shaking the pan and stirring occasionally so the onions don't stick, until they are soft and golden, about 45 minutes. Step 2 When the bread is soft, squeeze out the milk and discard the milk. Mix the bread with the ground lamb, cinnamon, allspice, 1 1/4 teaspoons salt and one-fourth teaspoon pepper, then form into balls a little smaller than a golf ball. 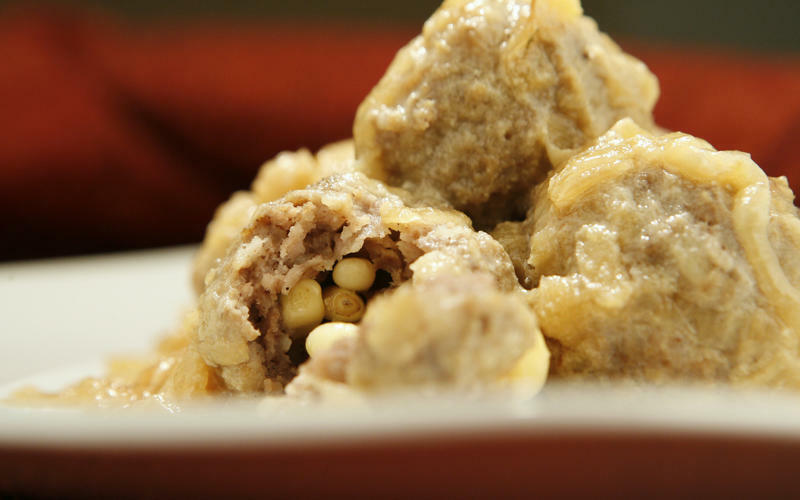 Make an indentation in each lamb ball and insert a few pine nuts, then close up the dent. Step 3Tuck the meatballs into the pan with the onions and cook slowly, covered, turning them now and then, for about 20 minutes. Step 4When the meatballs are done, whisk the yogurt and cornstarch paste together in a saucepan over low heat until thoroughly blended, and let the mixture simmer as slowly as possible, stirring in one direction, for about 10 minutes. Stir the yogurt mixture in with the lamb balls and onions, season to taste if necessary and sprinkle just a little dried mint on top. In Recipes-list.com we have selected the most viewed recipes from category - Main courses . Enjoy the best recipes specially selected for you! Middle Eastern bitki is the right choice that will satisfy all your claims.